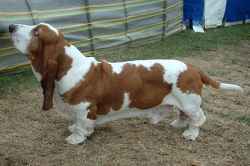 The Basset Hound is a chunky, short-legged breed of dog of the hound family, which hunts by scent or sight. Their sense of smell for tracking is second only to that of the Bloodhound. The name Basset derives from the French word "bas" meaning "low" or "dwarf". These dogs are around 33 to 38 cm (13 to 15 inches) in height at the withers. They have smooth, short-haired coats and are generally tricolour, black, white, and tan, red (sometimes called marmalade) and white, or, less commonly, lemon and white. They have long, low-set ears and powerful necks, with much loose skin around their heads that forms wrinkles. Their tails are long and tapering and stand upright with a curve. The breed is also known for its hanging skin structure, which causes the face to have a permanent sad look; this, for many people, adds to the breed's charm. The loose, elastic skin around the neck is thought to help catch the scent of what they are tracking. Tricolour BassetBasset Hounds are placid, but tenacious, dogs and are companionable, having been bred to hunt in packs. However, they should be trained in recall, as the breed has a strong hunting instinct and will give chase or follow a scent if they get one. The Basset Hound is known as an especially loyal breed. They are often very friendly and will gladly play with children. However, their tenacity, tendency to drool and relatively low canine intelligence also make them one of the breeds most often given up, or abandoned, by casual pet owners who are unwilling to make the commitment to raising a dog of this breed.